In continuation of my series on piping and instrumentation diagrams tutorials, we shall look at how to develop and construct a simple piping and instrumentation diagrams (P&ID). Before we start, I will advise you to go through Tutorials I . If you are completely new to P&ID, I will advise that you go through my various posts on piping and instrumentation diagrams to ensure that we are on the same page when we use the information provided to develop our P&ID. Let us now take a detailed look at the piping and instrumentation diagram developed from the information given above. Please note that the tag numbers on the P&ID have been arbitrarily added to give the P&ID an orderly look. The plain instrument bubble without a solid line across represents a field mounted instrument. The instrument bubble with a solid line across represents an instrument that is mounted in a central control room. (a) we were told the gas vessel instrumentation should have an inlet valve. 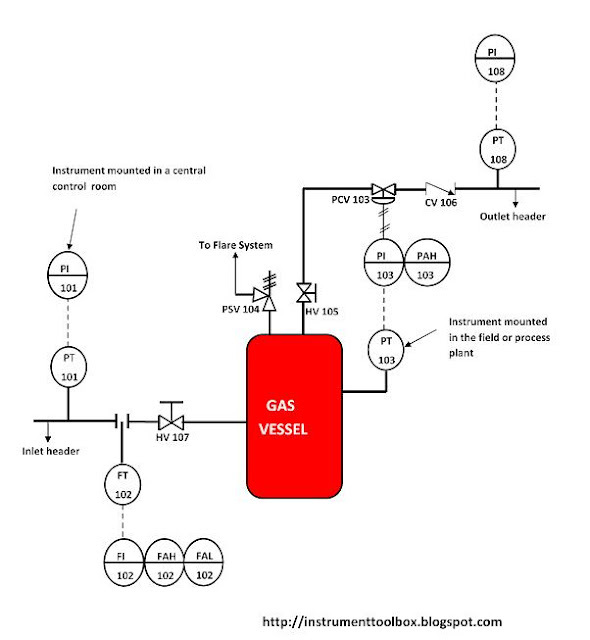 On the P&ID, inlet valve HV 107 is provided to manually regulate gas flow into the vessel. (d) A pressure safety valve is to be provided in the instrumentation to relieve and vent excess pressure to a flare system. On the developed P&ID, PSV 104 is provided to relieve excess pressure and protect the gas vessel. (e) A manually controlled hand valve is to be provided on the gas vessel outlet header. On the developed P&ID, hand valve, HV 105 is provided. (i) Lastly, a pressure transmitter and pressure indicator is to be provided to measure and indicate gas outlet pressure. On the developed P&ID, PT 108 and PI 108 are performing this function.